Quitting London has sucked in many ways. I’m missing the easy public transport, culture, friends, fitting in. Having to visit ten different shops to find tahini FFS. And some days I’d move back to that smokey temptress in a heartbeat. In light of this I’m trying to make the most of the benefits not living in one of the world’s most expensive cities. And one of the biggest pluses is S P A C E . Stretching my life out in a home that I love is pretty damn nice (I’ve still made sure I’m living within a 5 min walk to Tesco though, so *phew* my city loving vices can still be easily satisfied). So after far too long faffing about I’ve kicked myself up the arse and got on with…researching it (procrastination is one of my best buddies as you might have guessed). As I’ve found that designing a room for a toddler is quite different from a baby’s nursery. 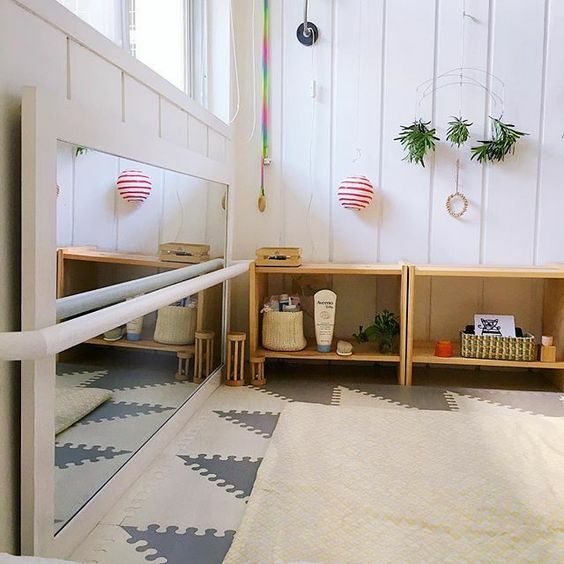 Rather than worrying about a nursing chair, soft tones, changing table and mood lighting…once the little one is charging about – it’s more about toy storage, sun proof curtains, un-pull-down-able shelves and where we are going to put the train set. I’ve found myself circling back to the Montessori method of designing a bedroom for a toddler. Montessori kids are taught to be independent in all aspects of their lives. Max isn’t at a Montessori nursery but I’m all for implementing this in the home as much as I can. After seeing the confidence and pride kids have with being able to do activities independently, it makes perfect sense to me. Adjust the scale: this will be Max’s own personal space so the Montessori principle is to design the scale appropriately. It’s a kid’s room so everything should be kid sized. And at the kid’s level – what’s the point of having pictures too high up on the wall for little ones to see anyway? Designing a room like this gives them ownership of their own space. I’m down with this, I like the idea of allowing him to shape his own life and activities even at an early age. To be honest he already rules the roost round ours anyway. This pic showing ways to incorporate this spotted on Instagram. Low bed: We’ll actually be moving the cot into the new bedroom to begin with. But once he’s ready for a Big Boy Bed (TM all parents ever) Max is going to have a bed on the floor. The Montessori reasoning for this is, as ever, about independence. Having the low down bed means he can get in and out of bed when he’s ready (which I’m sure will backfire on me…), but gives him the responsibility and independence to make that decision (note to self – must make sure the door closes properly before doing this!). On a practical level he currently spends 70% of his night in *our* bed. Like many babies and toddlers he falls asleep on us and sleeps well with the comfort and closeness of being in bed with us. So having a floor bed means we can easily get him to sleep there and then (in theory!) slope off to our own toddler free bed for a potentially decent night’s sleep for once. And this example from Mocka Australia on how to use their kids four poster bed in a Montessori bedroom. Accessible toy storage: Which would leave the decision of which toys to play with down to the little man, without the threat of climbing, clambering or mountaineering to get access to his faves. I’m probably going to go with the ubiquitous Ikea Kallax shelves – a set of eight, laid horizontally with baskets dedicated to different types of toys. I’d totally plan to circulate these but in reality, which my little guy, it’s likely to be car heavy. All day. Every day. Accessible clothes storage: Bear with me on this one. I *know* there will be times when every single piece of clothing down to the winter socks right at the back of the drawers will be strewn all over the room…but…I’m coming round to the idea of keeping Max’s clothes on his level too. I’m thinking this might help keep me on top of his clothes a bit more (cos I’ve got to get something out of this too right?!). Giving him a rail of clothes to pick from will help him gain independence and maybe his own little style. If we keep the clothes available weather and season appropriate he’ll hopefully be able to pick out his own threads without having too many wetsuits for Christmas dinner incidents. By the amount of kids I see wearing Paw Patrol t-shirts day after day I get the feeling Max dictating his own outfits is going to happen sooner or later anyway, so why not roll with it? We’ve got a built in cupboard I’m going to try to adapt for this but you could get something that could just use an open rail like this one from Great Little Trading. Or I’m pretty sure there’s an easy Ikea hack for the more adventurous This would be a great way for clothes storage, found here. Anyone out there had any experience putting together their own toddler Montessori (or not!) bedrooms? Any advice happily received!